Don Waller, a Professor of Botany and Environmental Studies at UW Madison, and his graduate student Erika Mudrak investigate spatial patterns in vegetation and tracking change in landscape ecology across spatial and temporal scales. In 2001, about 62 forest locations throughout Wisconsin were sampled with a particular sampling design which was intended to characterize the understory vegetation and to get a sense of the way different plant species were distributed in the woods (clumped in small patches, clumped in large patches, evenly distributed, etc.). The design (“Lblock”) consisted of 120 quadrants in three L shapes of 20 contiguous quadrants on each side. This would help to see if the Lblock design is useful for uncovering spatial patterns. The simulation generates a spatial plant pattern of a given density and clump size (the parameters tweaked) and samples it with the Lblock layout, and also with random, regular and cyclic 120-quadrant layouts (sampling designs that are more typical of what most ecologists would use). It then analyzes the sampled pattern with variograms to see if it can uncover the density and clump size of the original plant patterns that was generated. The output files provide a summary of the density and clump size estimated from each of the sampling designs, to be able to compare them to each other and to the parameters that generated the original spatial plant pattern. 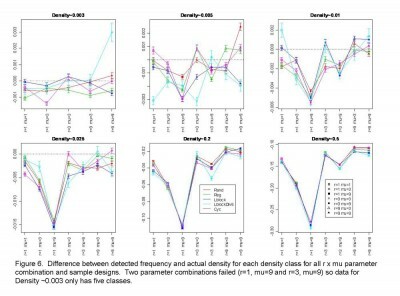 Erika found that the density and clump size parameters had a much greater influence on the results of the variogram than did the choice of sampling design. She believes that the sampling layout is not as important as the fact that each quadrat records only the presence (rather than abundance) of each plant. For instance, at high overall densities and high clump densities, quadrats are more likely to include several plants, and every sampling design drastically underestimates the true density. She concluded that the variogram is not an appropriate method for use in this particular project.